The cheesy surprise of these cheesy surprise spicy mini-meatloaves is cheese, so I guess it’s kind of like when you can tell that people are planning a surprise party for you because they’re acting weird. In both cases, it ends up not so much of a surprise as just a fun thing that happened. And these mini-meatloaves are indeed a fun thing that can happen to you and your friends, no matter what you heard on TV as a kid. The dry hunk of meat that generations of fictional children feared more than the bully who literally turns you upside to shake the change out of your pockets has come and gone. It’s safe now. Meatloaf is flavorful, legit, and good for a crowd since you just dump a pack of ground meat in a bowl and stir in some spices. Add a muffin pan for perfect portion control and you are good to go, friend(s). Enjoy! Jen Cantin graduated from Clark University in Worcester, Mass. with a degree in English and Journalism. She shares other (a)musings at Deep Fried Epiphany and dedicates this post to Meatloaf the singer for playing the bus driver in the Spice Girls movie. It was a great service to us all. My first try at these was pretty bland so I went kinda nuts. These are noticeably spicy. If you have a sensitive palate, then reduce or skip out on the cayenne. Pre-heat oven to 350°F and spray a muffin pan with non-stick spray. Heat a couple tablespoons of olive oil over medium heat. Add the onion and garlic and saute until tender, about 3-4 minutes. Transfer to a medium bowl. Add the next 10 ingredients (everything except the cheese and the barbecue sauce) to the bowl, and combine with your hands or a wooden spoon. Portion half the mixture evenly among the 12 muffin tins. Put one cube of cheese on top of each one then cover with the remaining meat mixture. 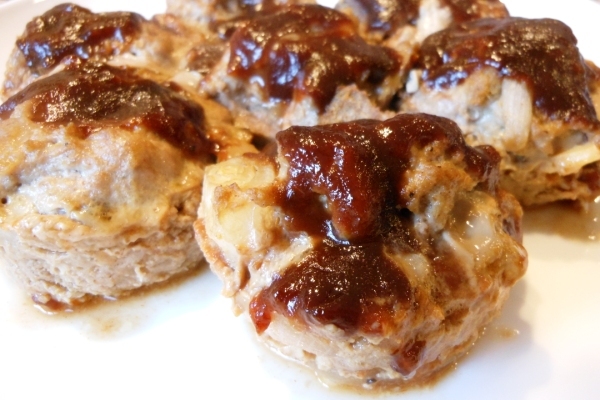 Top each meatloaf muffin with your desired amount of barbecue sauce, probably about a couple tablespoons for each. Bake for 20-25 minutes. Cut into one of them to make sure there isn’t still any pink.